William Robert Avrett, called "Billie" as a child and Robert as an adult, was born on December 1, 1901, in Milam County, Texas. The 1928 yearbook for the University of Texas in Austin gave his hometown as Cameron. 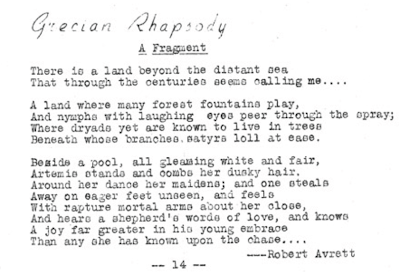 Avrett graduated that year, 1928, with a master's degree and a thesis called "Philosophical and Mystical Elements in the Poetry of Enrique Gonzalez Martinez." On the strength of his degree and his knowledge of the Spanish language, Avrett taught at the College of Mines and Metallurgy in El Paso, Texas (now the University of Texas at El Paso or UTEP), and the Argentine-North American Cultural Institute in Buenos Aires. He spent the greater part of his career at the University of Tennessee, from 1947 until his retirement. Avrett also studied under a fellowship at the University of Pennsylvania. William Robert Avrett died on November 23, 1975, in Milam County, Texas. I'm afraid I don't know of any further reading on Robert Avrett. 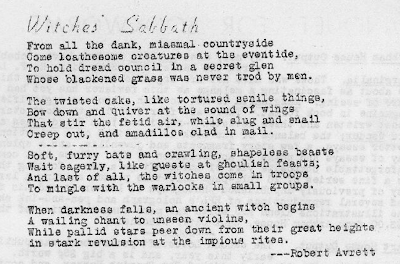 "Witches' Sabbath," a poem by Robert Avrett from The Acolyte #10. 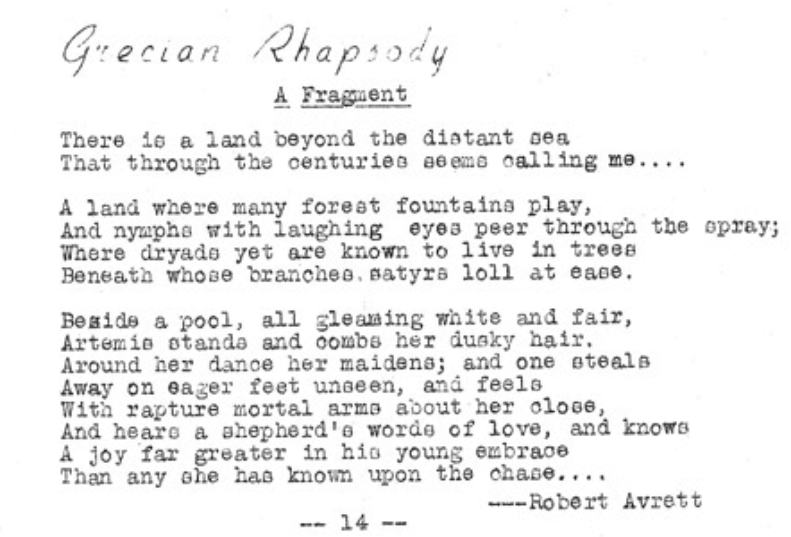 And "Grecian Rhapsody" from The Acolyte #11. 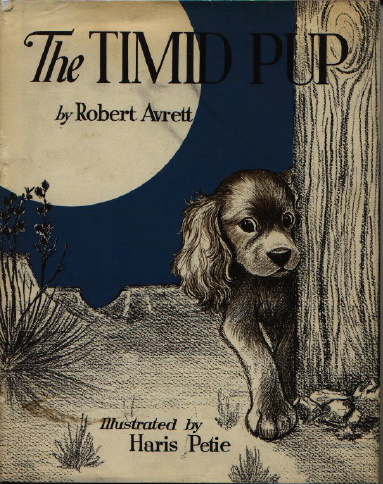 In 1964, Avrett published a children's book, The Timid Pup, illustrated by Haris Petie. Thirty-six years earlier, as a master's student at the University of Texas, Avrett had written a thesis whose title was a scholarly mouthful. I am reminded of a quote by Pablo Picasso: "It took me four years to paint like Raphael, but a lifetime to paint like a child." Thanks to Randal A. Everts for further information. Harold Stanley Walter Chibbett, also known as Harold S.W. Chibbett, Hal Chibbett, or Hastwa, was born on February 19, 1900, in Islington, London, England. He worked for the Inland Revenue--more or less equivalent to our Internal Revenue Service--in his home country for forty-three years, retiring in 1965. 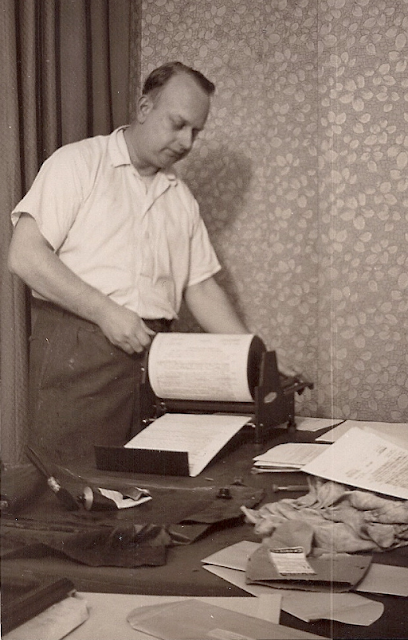 In that time, he served as secretary of the Science Fiction Association (SFA), attended British science fiction conventions (Eastercon, 1944; Whitcon, 1948), investigated paranormal and Fortean phenomena, and wrote fiction for a number of fantasy magazines. Chibbett also issued his own newsletter on his investigations. His output was otherwise sparse. Chibbett died four days after his birthday, on February 23, 1978, in Greater London. Science fiction historian Mike Ashley reported Chibbett's death to The Weird Tales Collector. An article and checklist appeared in issue number 4 in 1978. I have expanded on that list by looking for sources on the Internet. My list is by no means definitive. It can be hard to find Chibbett on the Internet because of all possible combinations of his names and initials, but keep looking. You may find something of interest. H.S.W. 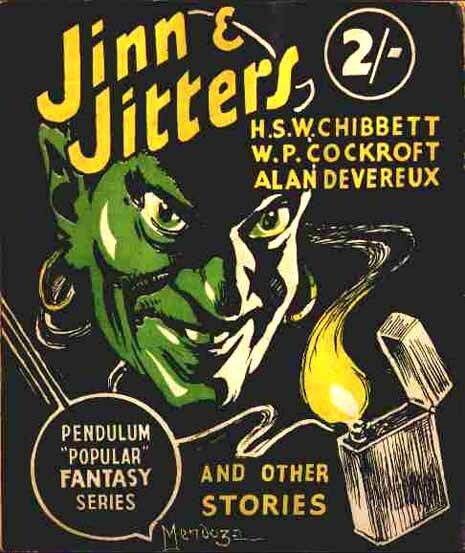 Chibbett's byline appeared on the cover of the British fantasy magazine Jinn & Jitters. The cover art is by Mendoza. 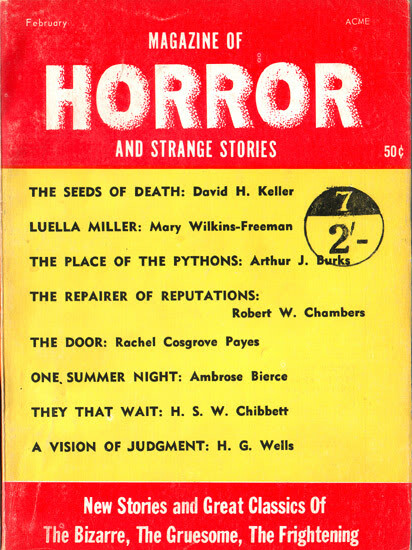 Almost twenty years later, it appeared again on the cover of Robert W. Lowndes' Magazine of Horror and Strange Stories. Other contributors to Weird Tales shown here: David H. Keller, Arthus J. Burks, Robert W. Chambers, Ambrose Bierce, and H.G. Wells. Note the British price stamped on the cover. Chibbett's name wasn't on the cover of Mystic Magazine in February 1955, but his investigations into hypnosis and flying saucers could be found on the inside. Raymond A. Palmer was the force behind the magazine. 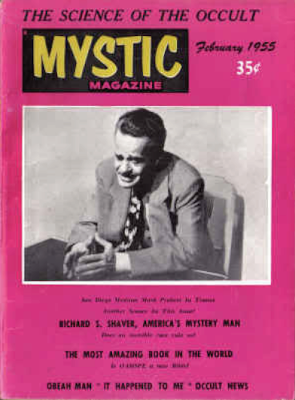 No wonder that top billing on the cover went to a story about Richard S. Shaver, "America's Mystery Man." Note the title "It Happened To Me." That same title was used for a series in Weird Tales in the early 1940s. H.S.W. Chibbett (1900-1978). Photo from the collection of Randal A. Everts. I just finished reading a very interesting book, one that any student of popular fiction in America might enjoy. 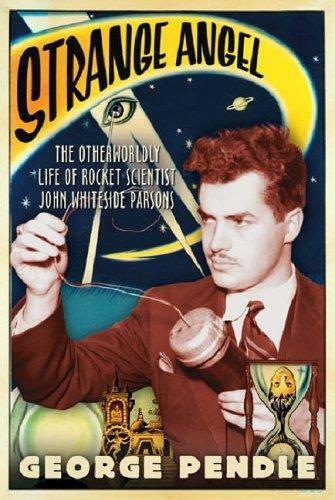 It's called Strange Angel: The Otherworldly Life of Rocket Scientist John Whiteside Parsons, and it was written by British biographer George Pendle (Harcourt, 2005, 333 pp.). Reading this book was a revelation to me: I have heard of John Whiteside Parsons (1914-1952) only in passing and didn't know anything about the origins of the Jet Propulsion Laboratory in Pasadena, California. Parsons, a largely self-taught chemist, rocketeer, and expert on explosives, was there at the beginning, or I should say before the beginning. Strangely enough, Parsons was also involved in Aleister Crowley's version of "magick" to the point that he attempted to conjure beings from another realms into our own--and may have believed at one time that he had done so. The cast of Parsons' life story is large and varied. It includes mathematicians and magicians, physicists and occultists, straight arrows and flim-flam men, bohemians and pillars of academia and government. Fans of Weird Tales will find some of the magazine's contributing authors in the pages of this book: Robert A. Heinlein, L. Sprague de Camp, Isaac Asimov, Ray Bradbury, Forrest J. Ackerman, Cleve Cartmill, Anthony Boucher, Jack Williamson, and Dr. David H. Keller. "The Unique Magazine" even earns mention itself in Strange Angel. The more complete story of Hubbard is that he is now in Fla. living on his yacht with a man-eating tigress named Betty-alias-Sarah [Parsons' former mistress], another of the same kind . . . He will probably soon thereafter arrive in these parts with Betty-Sarah, broke, working the poor-wounded-veteran racket for all it's worth, and looking for another easy mark. Don't say you haven't been warned. Bob [Robert Heinlein] thinks Ron went to pieces morally as a result of the war. I think that's fertilizer, that he always was that way, but when he wanted to conciliate or get something from somebody he could put on a good charm act. What the war did was to wear him down to where he no longer bothers with the act. Say what you will about L. Sprague de Camp, but he knew enough about human nature to pierce to the heart of the matter, to recognize the man behind the mask. Finally, a piece of trivia: John Whiteside Parsons' real first name was Marvel. By reading this book, you may decide that Parsons' given name was not far from telling the truth about him. Illustrations by William F. Heitman or attributable to William F. Heitman, from Weird Tales magazine. From top to bottom: "Hypnos" by H.P. Lovecraft (May/June/July 1924); "Imprisoned with the Pharaohs" by Harry Houdini (May/June/July 1924); "The Rats in the Walls" (Mar. 1924) by H.P. Lovecraft; "The Hound" by H.P. Lovecraft (Feb. 1924); "The White Ape" by H.P. Lovecraft (Apr. 1924). The only one of these five illustrations with a signature is the last, but before the November 1924 issue--the first with Farnsworth Wright as editor--only William Heitman received credit as an interior artist. These illustrations look to be the work of one artist. I think it's safe to assume they're all by Heitman. I can comment on their quality as well, if only to say that, judging from these illustrations, Robert Weinberg may have been a little hard on Heitman. Each has its merits. The illustration for "The White Ape" (also called "Arthur Jermyn") I think is most effective and my favorite among them. These images are courtesy of Alan Husby. I have altered them somewhat to improve their appearance (I hope) and to remove the text. More on Dorothy McIlwraith, including the first known photograph of her to appear on the Internet. The poem was published in Munsey's in 1927. Yesterday, April 22, 2012, was the first birthday of my blog, Tellers of Weird Tales. Today's entry is the 199th. Only a few hundred more to go, and I will have covered all the artists and writers who contributed to "The Unique Magazine." Stay with me. 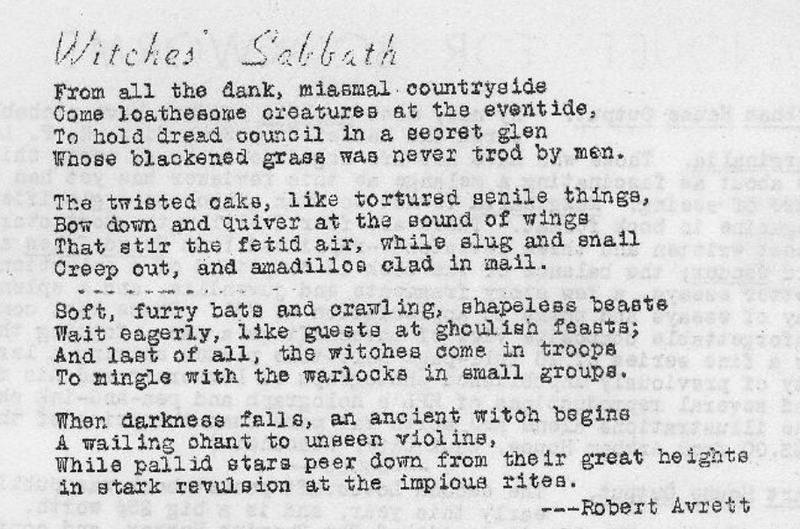 Scans of the poem and the photograph are by Randal A. Everts. Original sources are from his collection. 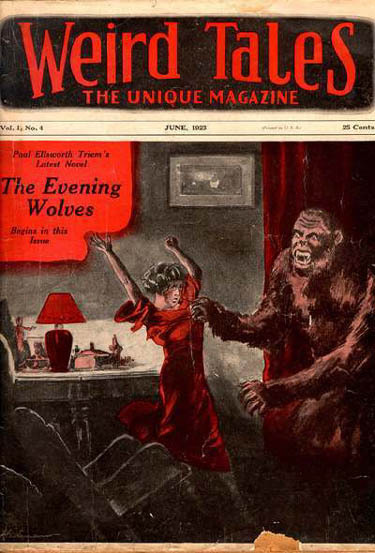 Much of the very early history of Weird Tales magazine is shrouded in mystery. 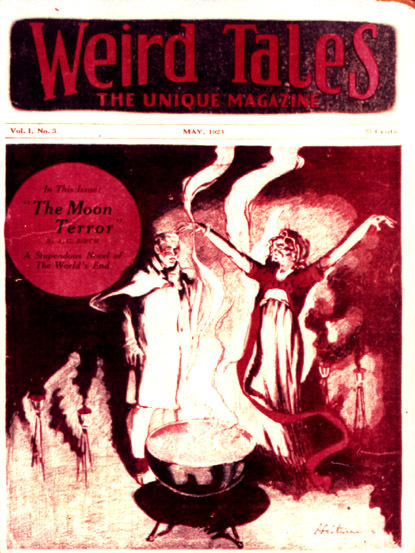 Launched in 1923 by Jacob Clark Henneberger, Weird Tales was based in Indianapolis and drew heavily upon writers and artists from the Midwest for its content. Wherever you read an index of the authors, artists, and stories that appeared in "The Unique Magazine," you're sure to see the name "Heitman" as artist--sometimes the sole artist on a given issue. So who was this mysterious Heitman? The answer, which may very well be revealed here for the first time in print (even if it is digital), is William F. Heitman, a rapid-fire newspaper illustrator of the early twentieth century. William Fred Heitman was born on January 31, 1878, in Germany and came to the United States as a young child with his parents. As a boy, Heitman lived in Indianapolis and Fort Wayne. He went to work for the Van Camp Company as a sign painter and decided then to become an artist. Heitman studied at the Indiana School of Art, worked for the Indiana Illustrating Company, and finally landed a job as an illustrator with the Indianapolis News in about 1897. Heitman spent the rest of his career doing layouts, illustrating feature stories, and drawing cartoons and caricatures for newspapers in Indianapolis, Cleveland, and St. Louis. Other artists with whom he worked included Sidney Smith (later of The Gumps), Johnny Gruelle (Raggedy Ann), and his close friend, Chic Jackson, creator of Roger Bean. 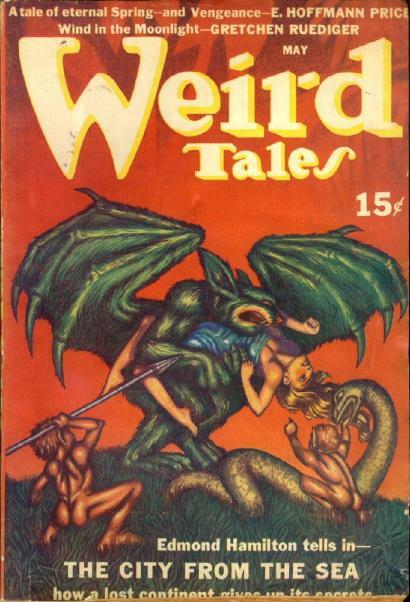 The first issue [of Weird Tales] featured no illustrations at all. Artwork used in the next year was poor. All were small pictures with little attempt at the weird or unusual. Artwork was mainly done by Heitman, an artist notable mainly for his complete lack of imagination. Heitman's specialty was taking the one scene in a frightening story that featured nothing at all frightening or weird and illustrating that. It was Heitman who illustrated nearly all of H.P. Lovecraft's early stories in Weird Tales (1) and he succeeded in capturing none of Lovecraft's mood of brooding, building horror. I haven't seen any of William Heitman's illustrations for the interior of Weird Tales. I can judge him only by his covers. His first (May 1923), showing a witch or sorceress and her cauldron, is a passable drawing, although the male figure seems a little stiff. I hate to say that his second (June 1923), showing an ape attacking a young woman, is practically inept. The female figure is particularly bad. 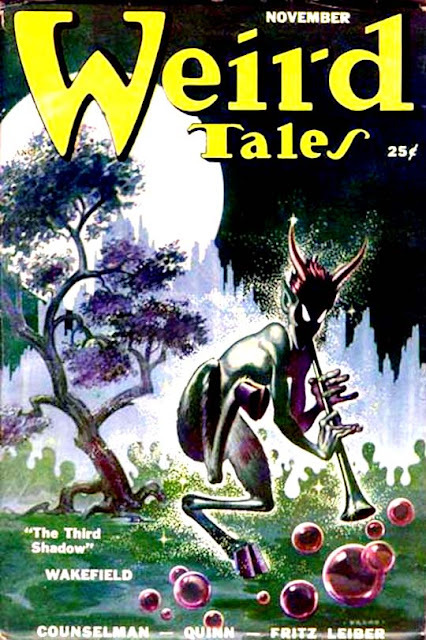 So why did an otherwise competent artist produce such work for Weird Tales? It could be that J.C. Henneberger or his editor was not particularly interested in illustration. I think it's more likely that they worked with an artist who was: a) close at hand, b) fast, c) cheap, and d) perhaps the only man available to them. I think it's safe to say Heitman was close at hand and fast. I don't have any idea whether he was cheap or not. As for being the only man available: publisher and editor may not have looked very hard. I guess we should remember that Heitman was working full time for the Indianapolis Star at the same time he was drawing pictures for Weird Tales. We might also consider that if it weren't for Heitman, there may not have been any illustrations in Weird Tales during its first year and a half in print. In any case, Heitman was replaced when Farnsworth Wright became editor. 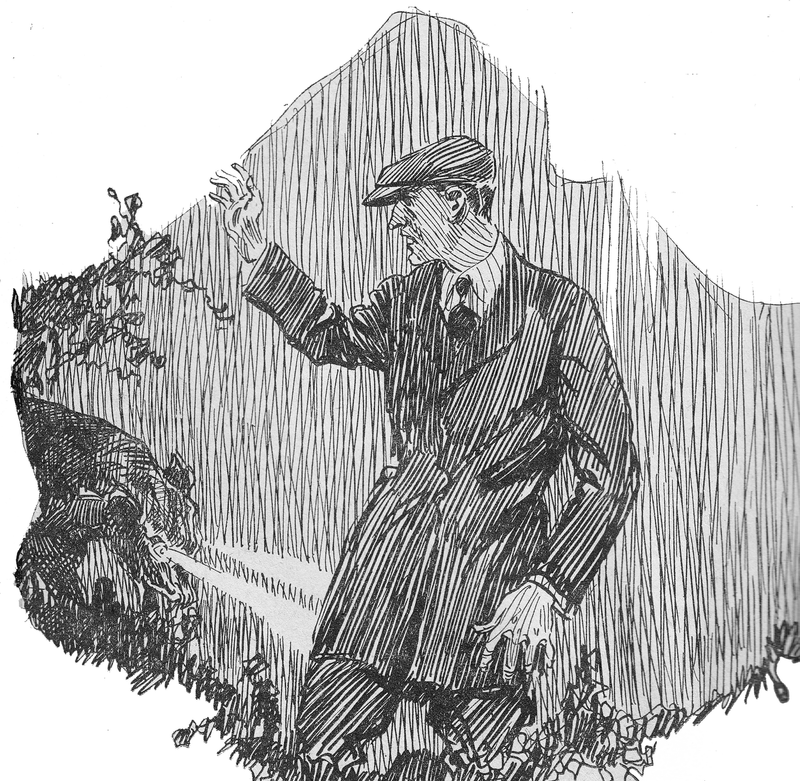 Andrew Brosnatch became the workhorse and carried the magazine through until June 1926. Heitman's last credits were for the June issue, 1925. Heitman continued to work for the Indianapolis Star until retiring in 1943. He died in Miami, Florida, the home city of his daughter, on January 10, 1945. His body was returned to Indianapolis for burial. 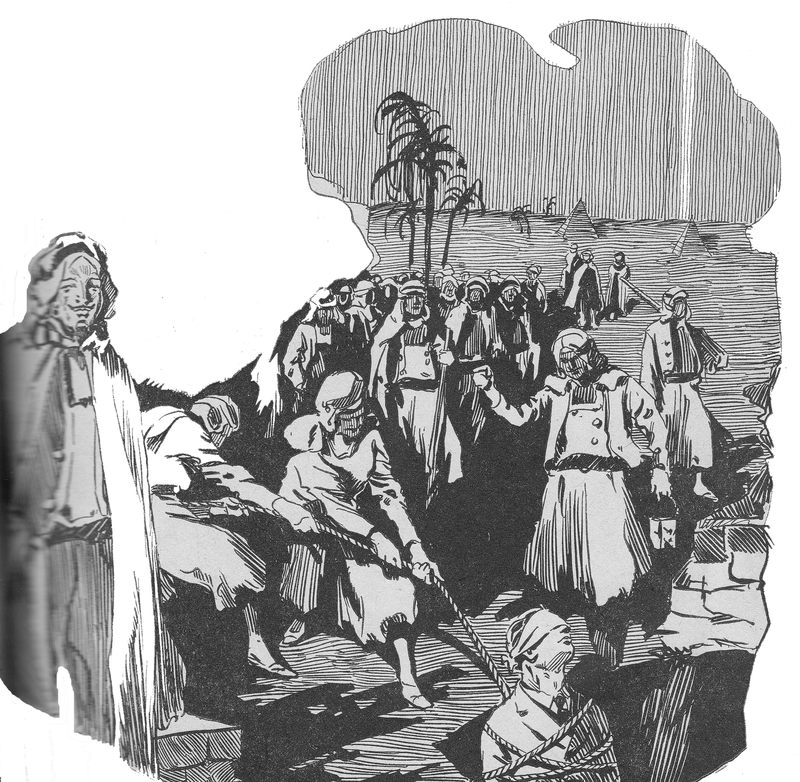 (1) According to Jaffery and Cook's Collector's Index to Weird Tales, the only illustration for a Lovecraft story for which Heitman received credit was "The White Ape" (Apr. 1924). "The Ghost-Eater" by C.M. Eddy, Jr.
Weird Tales, May 1923, the third issue of the magazine, with cover art by William F. Heitman. 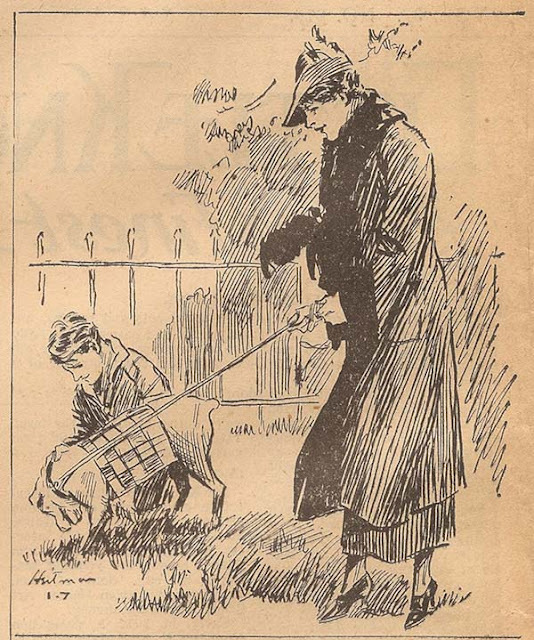 And the cover for the fourth issue, June 1923, a step down for the artist. I'll have to study the covers of Weird Tales, but this would have to be a candidate for the worst cover of the magazine. It's not that it's poorly conceived or poorly designed, but the handling of the figures, especially the woman, seems to be the result of an artist in a hurry or just plain bad draftsmanship. Proof that William Heitman could draw: an illustration for a poem by the Indiana poet Tramp Starr (Carl Wilson) from the Indianapolis Star, January 7, 1940. 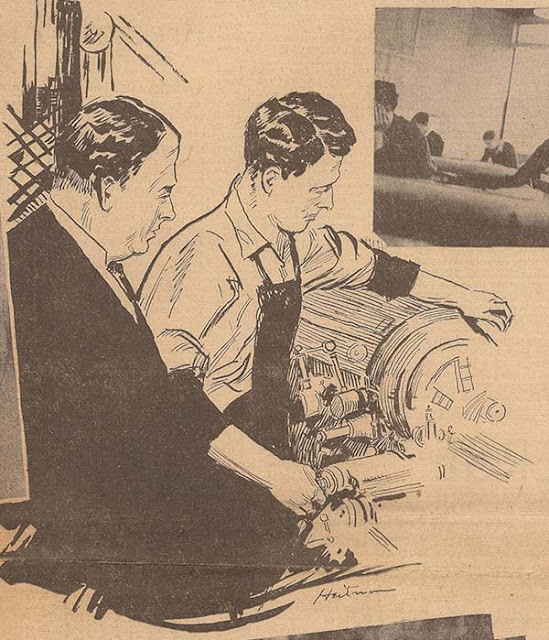 And a drawing from the same paper illustrating a feature on the Mechanic Arts School in Evansville, Indiana, May 5, 1940. Experienced in journalistic illustration, Heitman may simply have been ill suited to fantasy art. We should remember that a lot of early fantasy art was not very well done. After all, this was a new world of illustration. Thanks to a reader for corrections and further information. A reader of my blog requested that I write about some authors from the early days of Weird Tales. Isa-Belle Manzer will have to come first. Researching women authors is often difficult for at least two reasons. First, women usually took their husbands' names and can be hard to track in public records. Second, they were often housewives and did not list an occupation at the decennial census. In starting my research on Isa-Belle Manzer, I looked for her under that name and found a candidate in Milwaukee. Then my reader pointed out that she had written a letter to Weird Tales in November 1923, signed Mrs. D.M. Manzer, Amarillo, Texas. It didn't take long for me to find what I think was the real Isa-Belle. She was born Hattie Belle Sprague in Genesee, Michigan, on May 14, 1872 (according to the 1900 census) or 1873 (according to a list of deaths in California). Her father, Cornelius F. Sprague (1830-1913), was a farmer. Her mother, Elizabeth (1836-1903), called Betty or Betsy, may have been a physician. (The 1880 census record is somewhat ambiguous. That census showed the family living in Lane County, Kansas.) The Spragues had eleven children altogether, six of whom died young. By 1900, Hattie Belle Sprague had married, borne a son, and had been widowed. Her dead husband was named Crouch and her son Raymond. At that census, Hattie was working as a hotel housekeeper in Jackson Township, Sac County, Iowa. She remarried in about 1901. 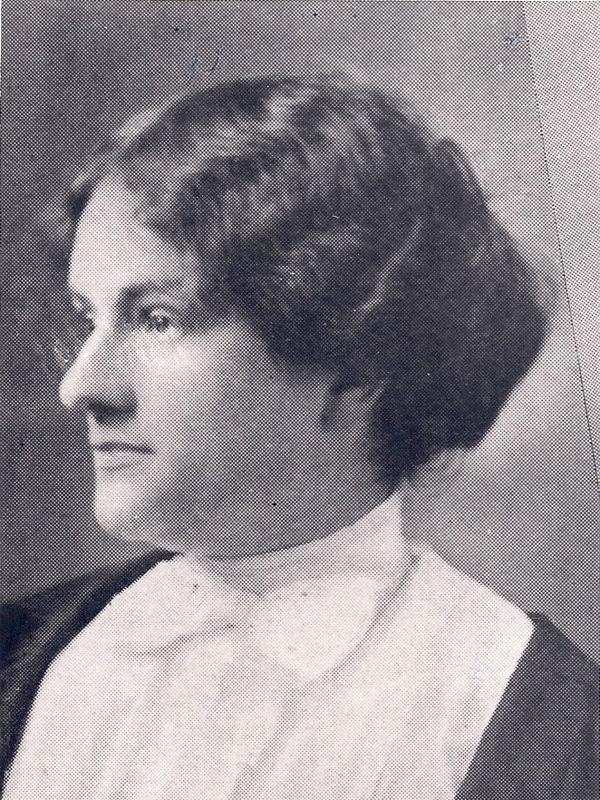 Her new husband, Deward Martin Manzer (1877-1940), was a laborer and a salesman. Nineteen twenty found the Manzer family living in Antelope, Nebraska. By 1930, they had relocated to Amarillo, Texas. Together they had, I believe, four children. As I said, Isa-Belle Manzer wrote a letter to Weird Tales, published in the November issue, 1923. In her letter (according to my reader), she told about a story that she hoped to have published in the magazine. The editor, Edwin Baird, asked his readers for their opinion. 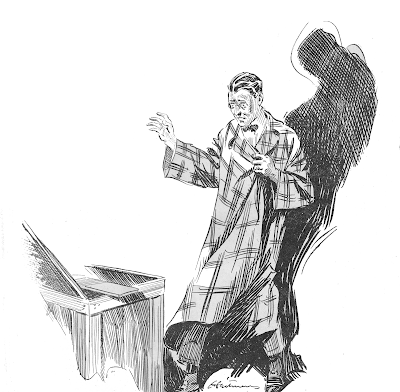 Whether they clamored for Isa-Belle's tale or not, it was published as "The Transparent Ghost" in a three-part serial in February, March, and April 1924. By the time the serial came to an end, Weird Tales was in trouble as it had been and would be so many times. The next issue was a giant-sized triple issue marking the first anniversary of the magazine. Hattie Belle Manzer never again wrote a story for or letter in Weird Tales. On August 11, 1944, she passed away in San Fernando, California. Unfortunately, I don't know of any further reading on Isa-Belle or Hattie Belle Manzer. Isa-Belle Manzer's serial, "The Transparent Ghost," appeared in three issues of Weird Tales without benefit of an illustration. I don't have any photograph of her or of any person or thing associated with her either. When all else fails, you can always post an illustration by Virgil Finlay. 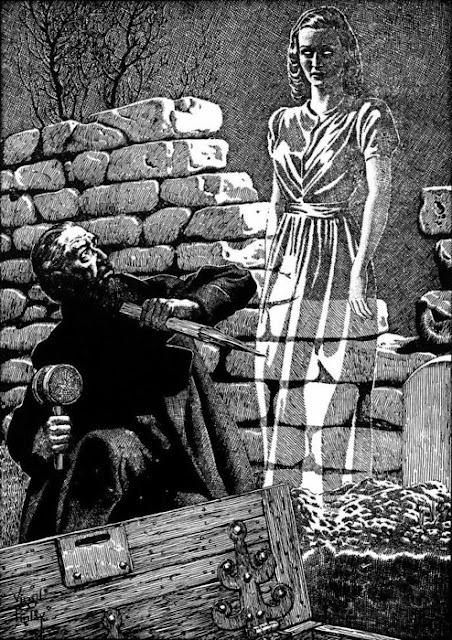 So here it is, an illustration from an unknown tale, showing a ghost who is more translucent than transparent and a man who looks a little like Bela Lugosi about to drive a wooden stake into the heart of an unseen corpse. I should point out that many people of earlier times, even as recent as fifty or a hundred years ago, seem to have been obsessed with ghosts. You might think that's because they were uneducated or unscientific or superstitious. There could be another explanation, though, a better explanation. In our age, we are insulated from death. A century ago, death touched every family as a regular and too frequent occurrence. People died at home and not out of sight in a hospital or nursing home. They were often dressed for burial at home and laid to rest in a family plot close by. Death was a shock that could come at any time to any person, too often to children. It's no wonder people would hold out hope for something that might survive, for some possibility of contact with the departed. Hattie Belle Manzer came from a family in which half her siblings died young. Her first husband passed away before she was thirty. Is it any wonder that she might write a story about a ghost? 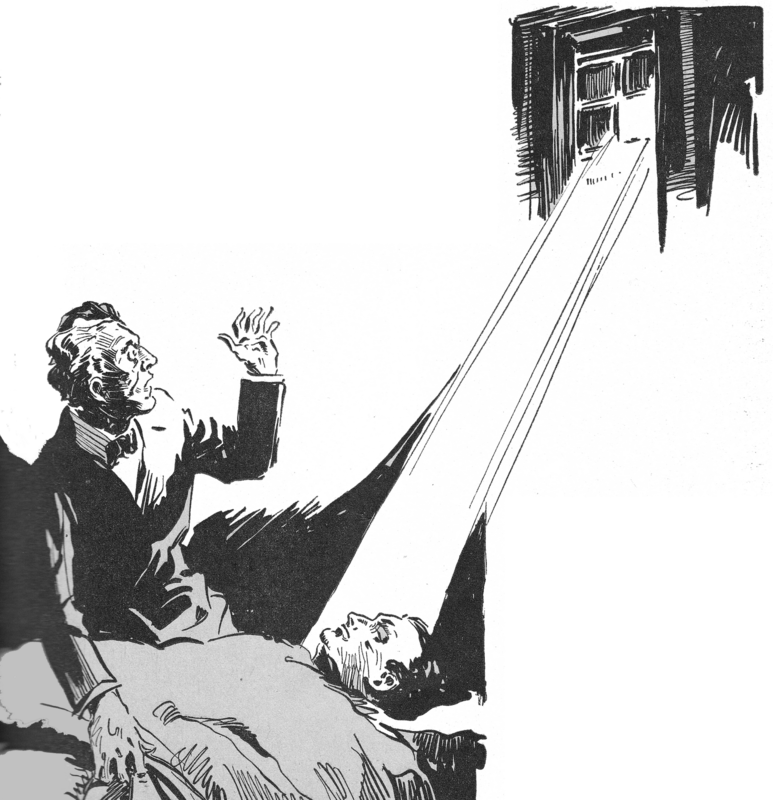 Postscript: I have heard from a reader pointing out that "The Transparent Ghost" is actually not a ghost story but "involves a mad doctor who has turned himself invisible, creating mischief [and] giggling all the while." I guess that shoots a hole in my proposed explanation of Isa-Belle Manzer's motivations. Well, what isn't true here may be true somewhere else. Thanks to my reader for the clarification. Update (Mar. 31, 2019): John Locke discusses Isa-Belle Manzer and her story at length in his book The Thing's Incredible! The Secret Origins of Weird Tales, 1923-1924 (2018). Mr. Locke considers the story to have been a prank. Not having read it, I can't say. Whatever the case, the general opinion of "The Transparent Ghost" is pretty low. Thanks to Randal A. Everts for Hattie Manzer's obituary. Part 1--"What About Dorothy McIlwraith?" Plus most of the authors of the Golden Age of Science Fiction from my previous list. 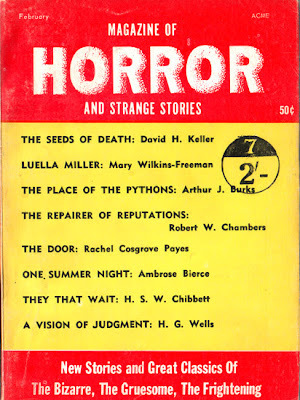 What's more, writers such as H. Bedford-Jones, Robert Bloch, Carl Jacobi, and Manly Wade Wellman contributed more stories to Weird Tales after May 1940 than before. Darrell Schweitzer also defended her in a lengthy article, "What About Dorothy McIlwraith? ", in WT50: A Tribute to Weird Tales (1974). The article is more than you're likely to read about the long-serving editor anywhere else. (2) Mr. Schweitzer made a number of important points in his article. First, as he wrote about halfway through, "[A] magazine can't survive by living off the past." Like it or not, the magazine market changed as the nation went from depression to war to postwar. Moreover, fantasy fiction changed as science fiction ascended, especially after the war. With talk of atom bombs, spaceflight, and flying saucers, weird fiction may have seemed quaint to a lot of readers of the late 1940s. (3) In any case, Dorothy McIlwraith took over a magazine that had always struggled and carried it through for over fourteen years as markets, magazines, and the tastes of the reading public changed. The deaths of Lovecraft and Howard were a disaster. Weird Tales may never have recovered from that disaster. But it survived until September 1954, mostly under the editorship of Dorothy McIlwraith. Darrell Schweitzer's second point involves artists. 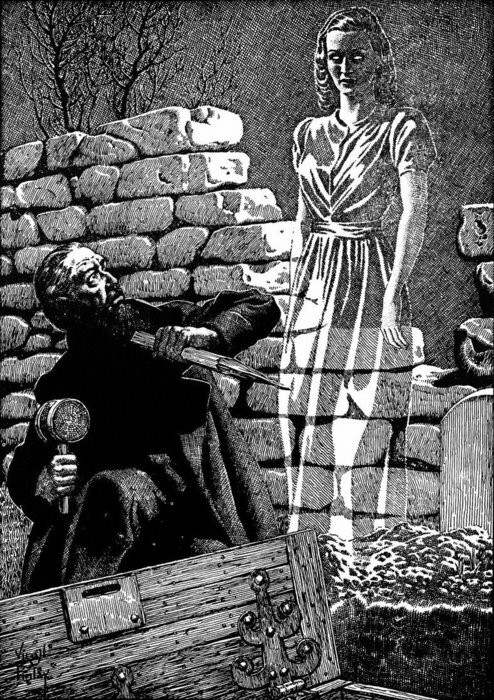 Weird Tales may have lost Virgil Finlay, Hugh Rankin, and J. Allen St. John with the 1930s, but Margaret Brundage remained (to the chagrin of Mr. Schweitzer). To take their place, Dorothy McIlwraith found Lee Brown Coye, Boris Dolgov, Matt Fox, Frank Kelly Freas, Albert Roanoke Tilburne, and Edgar Franklin Wittmack. She also continued to use art from Hannes Bok and Harold S. De Lay, who had squeaked into the pages of "The Unique Magazine" before the 1930s ended. Coye, Dolgov, and Fox in particular possessed a knack for the weird and uncanny, while Freas broke into science fiction largely on the strength of his work for Weird Tales. So [Darrell Schweizter wrote in 1974], Dorothy McIlwraith deserves, in my estimation, credit for editing the magazine well as long as she possibly could, and giving us quite a few high quality stories. Anthologists ought to re-read those issues. Perhaps they don't contain as many classics as the Wright issues, but they do have a lot of good and untouched material. That oversight has probably been corrected in recent years as editors and publishers mine the popular fiction of the last century for more material. So who was this editor who kept Weird Tales alive for fourteen years? I'll write about her more in my next entry. (1) Quoted in The Unofficial Robert Bloch Website from an interview that originally appeared in Robert Bloch: A Bio-Bibliography (1979). 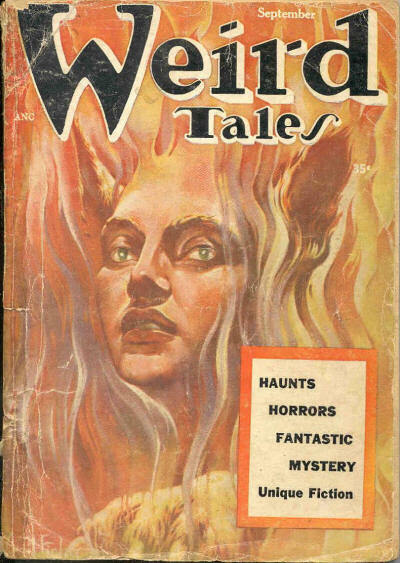 (2) In fact, I haven't even been able to find a photograph of Dorothy McIlwraith, despite the fact that her tenure with Weird Tales was second only to Wright's and then only by a couple of years (from 1940 to 1954). She also edited Short Stories magazine during that entire time (from 1936 to 1954). (3) I'll talk more about that in a posting on Fritz Leiber, Jr., sometime soon. Lacking a photograph of Dorothy McIlwraith, I can at least offer a copy of her signature from 1941. Several months ago, I wrote about H.P. Lovecraft and his story "The Call of Cthulhu" in a four-part article called "Biography and 'The Call of Cthulhu'." That article has proved to be be one of the most popular among readers of my blog, and it prompted an exchange between me and a reader named Magister. My supposition was that someone--either Lovecraft or Weird Tales editor Farnsworth Wright--revised "The Call of Cthulhu" before it was published in the February 1928 issue of Weird Tales. My sole evidence for that supposition comes from the story itself: in order for "The Call of Cthulhu" to have been set in the very recent past--with its final chronological events having taken place (by implication) in late 1927--someone would have had to revise some of the dates in the story. Magister questioned that, and rightly so, for Lovecraft was notorious for not wanting to retype his work. Also, Magister pointed out that the surviving typescript does not include the revisions to dates I had supposed. So did Lovecraft write "The Call of Cthulhu" in 1926 in its final form and set the story in the near future? Or did someone revise some dates immediately before it was published in 1928 to reflect the year's gap between original submission and acceptance for publication? I tried to make the case for a revision. My case may not have been very compelling and I may have argued too much in its defense. Magister was doubtful of a revision and gave some strong evidence against it. You can read our exchange of comments below. Something has been bothering me in the time since I wrote my comments however. Again, it's a date, or I should say the lack of a date. Lovecraft was fastidious in presenting the facts of his story. He tells us in documentary detail when and where events occur, who was present, what they saw or said or experienced. He is vague in at least one place, though. Towards the end of the story, the narrator writes: "Sailing for London, I re-embarked at once for the Norwegian capital; and one autumn day landed at the trim wharves in the shadow of the Egeberg" [emphasis added]. As "The Call of Cthulhu" was published in February 1928, that "one autumn day" could only have been in 1927, a date still in the future when Lovecraft composed his tale. In fact, all the exact dates Lovecraft gave in "The Call of Cthulhu" are before the late summer or early autumn of 1926 when he wrote the story. None of the events that take place after 1926 have dates attached to them except for the death of George Gammell Angell in the winter of 1926-1927. It appears as though Lovecraft was projecting his story into the very near future. If that was the case and there weren't any revisions, then the publication of "The Call of Cthulhu" in February 1928 was timed to perfection. I say that because the events of the story and its framing device would have come to a close short days or weeks before it was accepted and typeset for publication. One of the great innovations in "The Call of Cthulhu" was its seeming factual basis and its immediacy. So was its date of publication intended to enforce the immediacy of the story? Did Farnsworth Wright recognize in 1927-1928 that now was the time to publish "The Call of Cthulhu"? My feeling is that he did not, that the publication of "The Call of Cthulhu" just came about in a certain way unrelated to the timeline within the story. In any case, that perfect timing--my perception of intent on the part of author or editor--is what led me to think there were revisions to "The Call of Cthulhu." Magister is probably right: there probably weren't any revisions, and Weird Tales printed the story more or less as it was originally composed. But it could not have come at a better time. OK, I see your reasoning regarding the dates; still, I can't regard that as conclusive evidence of a revision. Weird Tales rejected the story in October 1926. Would the time-frame of the story have been laid much earlier in that version? I doubt that, since it would have given the plot a much shorter time to unfold. The date of the earthquake was fixed, since that was a real event. One more thing: Donald Wandrei said nice things about "The Call of Cthulhu" to Farnsworth Wright when visiting Chicago, prompting Wright to ask to see the story again, whereupon it was accepted. If there were new revisions, Lovecraft would have had to prepare a new typescript of the story, because the dates as given are present in the preserved typescript (I'm assuming, since the corrected version published by Arkham House in 1984 is based on this typescript and the dates are there). Since Lovecraft hated typing and "The Call of Cthulhu" is a very long story, it seems very unlikely that he prepared a new typescript; instead he must have used his old one -- the one that was rejected in October 1926 -- and this must be the T.Ms. that we have today. With the post-1926 dates. As for De Camp... For starters, it is now 36 years out of date. Lots of new information has come to light since then. Second, the errors. Without bothering to check the book itself, I remember that De Camp gave the wrong title for one of the De Castro collaborations, and when he quotes Lovecraft's and Fred Jackson's poems (the ones with which they put their feud to rest) he has obviously switched them. 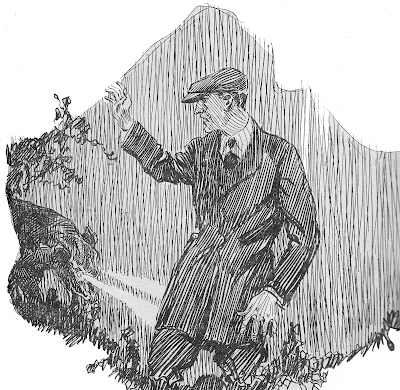 In one place, he corrects his source even though he provides no evidence why such a correction is necessary: When Clara Hess says that she sometimes met Lovecraft's mother at Theodore Phillips's place at Angell Street, De Camp corrects this to "Whipple Phillips", apparently unaware that Whipple's cousin Theodore indeed lived on the same street. And so on. Third, the notes. Mixing your sources into one big lump instead of providing one note per quotation is not how it's done. It is no help to the reader, and I have found quotations that do not occur in the sources where De Camp says (or seemingly says, since his references are so difficult to untangle) they occur. Fourth, the silliness in x-ing out the name of Lovecraft's friend whom Lovecraft described in a letter as a Nazi sympathiser, because the man was still alive at the time. De Camp leaves enough information to make a 99% certain identification of Alfred Galpin possible. I was able to figure this out years before the uncensored letter in question was published. Fifth, the supercilious style. We learn lots of things that Lovecraft did wrong, i. e., he did not do them the De Camp way. Thus, we learn more about De Camp's views and values than we learn about Lovecraft's. De Camp simply has no understanding of Lovecraft's views and therefore doesn't explain them very well. Sixth, the selectiveness. De Camp knew about Lovecraft's humorous stories, yet he never mentions them at all. Not even one word. I'd recommend Joshi's H. P. LOVECRAFT: A LIFE or its unabridged form, I AM PROVIDENCE.